I can knit lace. But I discovered that if I screw it up, I cannot fix it. Sometimes when J poops really loudly, it scares the dogs. J finally fits into one of his handmade gifts! Thanks for the great sweater K! Don’t you all just love the colors? It has just recently (in the last few weeks) started that little J notices his surroundings more. I am now convinced that the smiles I see are not only due to gas, but actually as a reaction to the things he sees. Let the pictures below of him in his bouncy chair and on his play mat be evidence of this new found interactive-ness. Enjoy! So, I have been a little one sided recently when it comes to the blog. Baby, baby, baby. Althought that is fun, I need to get a bit of a life! 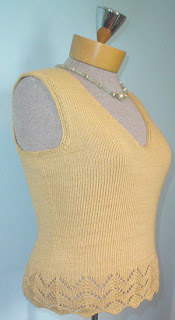 Just recently, I have tried to put some more of my past made projects on Ravelry. I have also just recently added quite a few things to my queue (more on that later). But, if you aren’t cool enough to have an account on Ravelry, below is a sample of the things I have made in the past and recently. Yesterday was the Superbowl, as I am sure you know. Me and the fam went to a par-tay hosted by our friends Sonia and Amy. J was cute, but not so amused during the first half. The adults in the room however, were very amused. Nothing like a crap-load of food to make a group happy! One of the main activities of the evening was a quiz about the Superbowl that Sonia got from work and brought to the party for us to play. Amy and Sonia even provided prizes, one for the winner and one for the looser! Lyndsay ended up being the big winner, taking home a DVD copy of Rudy and Jerry Maguire, while I ended up being the big loser (I only got 2 out of 15 correct). I won something great, a can of Cheddar Cheese Pringles! I have not yet popped open my prize, but they are calling my name so I don’t think it will be long before they are gone. I hope that all of you out there had just as much fun yesterday as we did.